Enhancement of cultural heritage through ICT. The project consists in the permanent monitoring of structural buildings and is focused on the creation of a system of observation, based on minimally invasive technologies, sustainable and innovative, so as to provide information about the structural behavior under conditions service and especially in the presence of seismic events. The large investment of public funds used in the reconstruction of the city of L’Aquila needs an intelligent observatory, able to investigate the effectiveness of the used technologies, especially in relation to their performance over time. 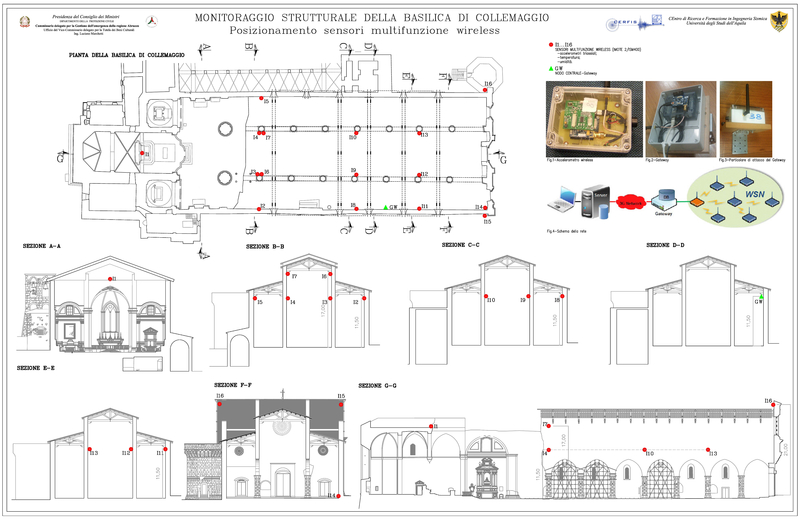 University of L’Aquila has successfully developed a prototype system design used for structural monitoring of the “Basilica S. Maria di Collemaggio”: a network of wireless sensors equipped with accelerometers, strain gauges and inclinometers has been implemented and actuated. The currently operating system has monitored the dynamic behavior of the Basilica during numerous seismic events occurred after the main shock of April 2009. All information is intended for an archive that is both “history” of the events and the added value of information given by the possibility of correlation analysis of the variables that characterize the life of the structures. In this element resides the need for a monitoring platform that makes possible the treatment of the information according to different modes of use, from the simple display scale up to representations of maps of “reactivity”, for which we will study the most suitable forms of modeling. The building monitoring system will be the basis for the implementation of other systems aimed at protecting the health of citizens in case of natural disasters (earthquakes or other catastrophic events). It will exploit the ability to constantly track the status of the structures in a timely manner to detect the occurrence of dangerous events and activate, when necessary, proper mechanisms for emergency response. The monitoring system will be used to get an immediate assessment of the safety level of the building, at the global level and at the level of individual parts. This characterization will be critical to the implementation of further and more efficient mechanisms for the protection of citizens. To achieve these goals the structural monitoring system will be used as part of a wider system of data acquisition, processing and control. The building sector is the largest energy consumer in the world. Therefore, it is economically, socially, and environmentally significant to reduce the energy consumption of buildings. This is the reason why a huge research effort is being spent in this area. The Building Automation research activities in the context of the INCIPICT project focuses on data-based modeling and control of buildings with the goal of energy efficiency. On this line of research, a collaboration between Dr. Alessandro D’Innocenzo (University of L’Aquila) and Prof. Rahul Mangharam (University of Pennsylvania, Philadelphia) officially started this year. Dr. Francesco Smarra, postdoctoral researcher at the University of L’Aquila, is spending a research visiting period at the University of Pennsylvania co-funded by INCIPICT and by Prof. Mangharam. The main objective of this collaboration is exploiting learning techniques for predictive control of power consumption in buildings. More precisely, our techniques will provide a predictive mathematical model of the building behaviour that will be used to apply control strategies that maximise energy and money savings while guaranteeing thermal comfort for the occupants. We already applyed our techniques to the historical data of the Human Sciences Building of the University of L’Aquila obtaining promising results: next step is “closing the loop” applying our control algorithms to the same building. In perspective, the final objective is applying our methodology to networks of buildings of the (smart) City of L’Aquila. The idea is about providing services for the protection, enhancement and enjoyment of the local cultural heritage (historical, architectural, artistic and naturalistic) designed to promote of cultural heritage and innovative policies supporting tourism. The basic idea is to develop an open technology platform affecting two subjects/roles: the tourist, intended as a user of the services provided by the platform for the creation and enjoyment of their path; service providers (ISP), defined as those working with tourism and culture, which can be integrated directly into the platform support (with the approach of the app market). The final goal of the project is the building of a new tourism models that induce a greater understanding of the evolution of the urban and extra urban environment. According to this vision, visiting a site of interest, is enhanced with many additional content, procuring visitors an immersive experience in which there is no need to “seek” information because it is offered in the right way and at the right time using modern localization technology and mobile communications. In this way, users will become part of a “cultural social network” to become active in cultural enhancement, contributing with preferences and interests. During the experimentation we intend to set up a set of services representative of the potential innovation introduced from the methodologies for knowledge and from technologies proposed for the preservation and enjoyment of cultural heritage. Tourists visiting the city will be able to get information via smartphone or tablet by simply pointing their camera towards the object of interest. To get information about a historic building or a monument will be sufficient photograph it.